I’m Svenja Kroeger, a PhD student from the University of Aberdeen (UK, Scotland) under supervision of Dr. Julien Martin and Prof. Jane Reid. 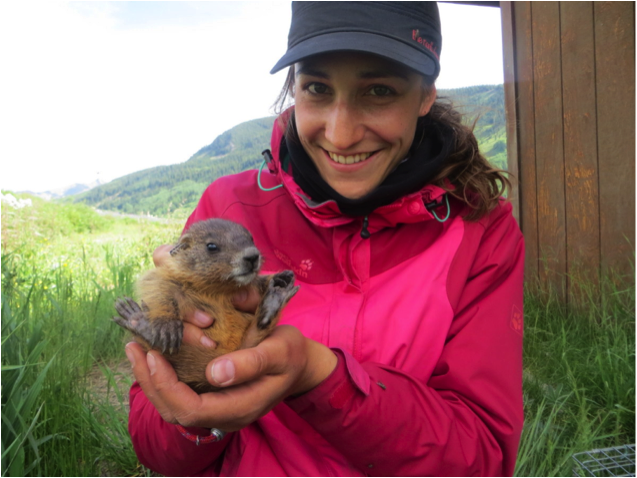 I study senescence in yellow-bellied marmots and over the summer I spent three months at RMBL to help with the data collection for this long-term study. I’ve had an awesome time observing and trapping these adorable creatures and I’m looking forward to spending some time with them next year too! Over the last months I’ve grown really fond of a lot of the animals that I’ve been observing, so I’d like to not only introduce myself but also a couple of memorable marmots that I’ve encountered during my time here. In the picture above I’m holding the sweetest and smallest pup I’ve ever had the joy of getting my hands on: ‘Ghost’ - a tiny lady, weighing a mere 250 grams when she first emerged. Her name stems from the fur mark on her back, which resembles the ghost in ‘pacman’. 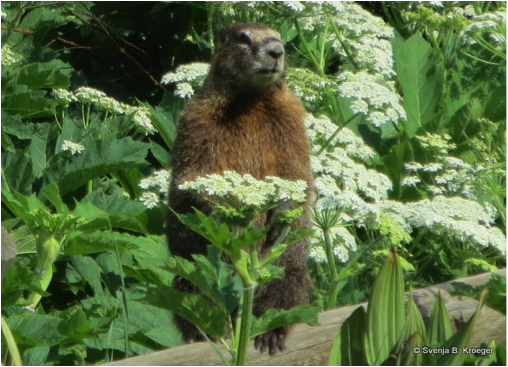 Another marmot that has definitely conquered my heart is this handsome guy in the picture below, a sturdy male by the name of ‘Dandelion’ (aka ‘Dandy’). In fact he is the first marmot I ever named! I’ve spent a lot of time watching him as he is fairly comfortable with people nearby. Also, he’s sort of ‘the man’ in Gothic town at the moment and as his name suggests he LOVES dandelions! I can’t wait to see him again next year!